The most imposing building in Wangaratta. The Cathedral was built in stages, with most of the granite coming from the nearby Warby Ranges. In 1855 Wangaratta Anglicans met at the Court House to discuss building a church on the hill, the present site of Holy Trinity Cathedral. 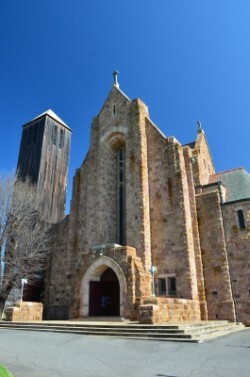 In 1908 the foundation stone of the Cathedral was laid by the Right Reverend AV Green, Bishop of Ballarat, and the Cathedral was dedicated on August 24th 1909. Very early services had been conducted in a slab building on the corner of Baker and Templeton Streets, built by John Foord.